Play against other people online! 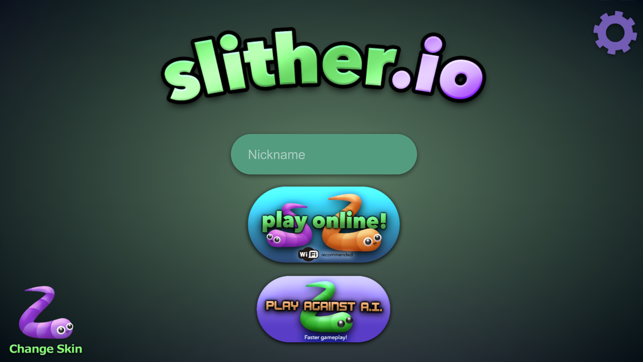 Can you become the longest slither of the day? If your head touches another player, you will explode and die. But if other players run into YOU, then THEY will explode and you can eat their remains! 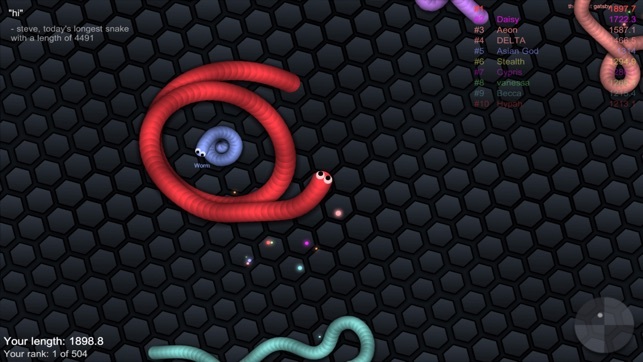 In slither.io, even if you're tiny, you have a chance to win. 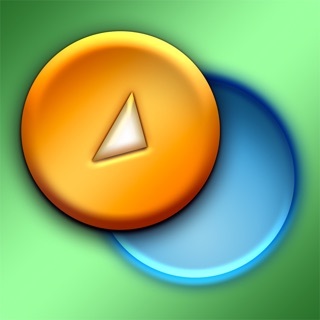 If you're skilled or lucky, you can swerve in front of a much larger player to defeat them! 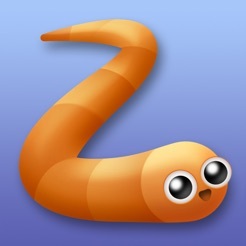 Download now and start slithering! This is a game that started out as innovative, fun, and family friendly. I truly enjoyed it and had a blast playing with my kids. For whatever reason, it appears that the author/company has stopped doing anything to maintain the playability of the game. I've noticed the performance of the app steadily decline over the last two months with no communication from the company indicating they are trying to fix the problem. The "live" mode where you play against other players has now reached the point where it simply doesn't work 95% of the time. If you're lucky enough to get through a short game without the app totally crashing, you're likely frustrated by the games inability to keep up with gameplay. The screen will frequently lock for seconds at a time... and then comes back to life and shows you that you died during the freeze. I'm actually very surprised that there aren't performance requirements for games in the App Store that remove unsupported or poorly performing apps. At this point, this game is entirely unplayable, and I would recommend removing it from the store until the company steps up and fixes the performance problems. Unfortunately, this is yet another review regarding the same issues, and it appears nobody will be fixing anything in the near future. 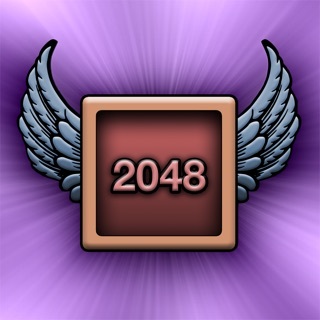 Don't download this game and support a developer that doesn't live up to their responsibilities. This game was super fun at first, like really addicting. I'm not sure what everyone is talking about the glitching and lagging because that has never happened to me before while using the game, but perhaps it's just because these people are not connected to wifi and are using data. ANYWAYS, the real problem is the creepiness of the game. I thought it was all fine and games, and then i found a really good strategy of circling around tinier snakes and trapping them when i'm big enough. That was slightly creepy, but okay since i was in control of it. But i soon discovered that many others used this strategy as well, and would trap me when i was smaller. It was disgusting and creepy, especially cause you know there's no way out but they're just gonna keep entrapping you until your face finally hits their tail and you die. 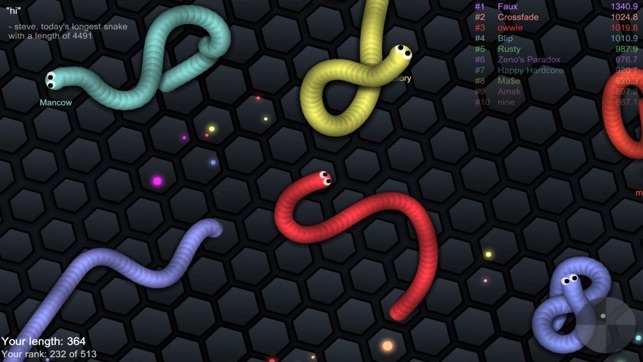 What's worse is that the game doesn't go back to the home screen for a few seconds after you die & turn into little bits so you can actually see the snake that trapped you eat up what used to be you. After that the snakes all just seemed super creepy and weird to me. I deleted the app like 5 months ago, and just re downloaded it today to try it out once more. Still superrrr creepy! Just deleted it again, can't get over it! I have been playing this game since the beginning, on an iPad with high speed wifi. I refresh the app before playing to avoid any lagging issues. Since the past update I've been experiencing the same issues as other reviewers. When I speed up to either avoid or cut someone off I will die but clearly I shouldn't have since there head touched me first. There is also the issue of dying before your head touches someone while a gap is present. 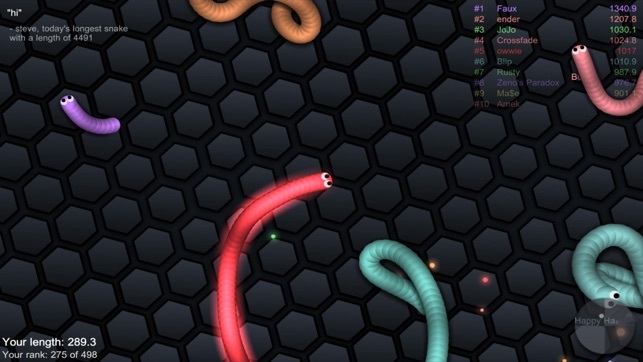 And lastly my biggest pet peeve, when I am the biggest to third biggest in a room I have a 50% chance of loosing control of my snake. When I'm trying to turn or move, the app is unresponsive. It doesn't matter if I'm running or not. Please do what you can to fix these problems. Myself and others would greatly appreciate it. Thank you for your time. Update: I’m still having the issue of loosing control of direction. When I try and turn the app is clearly forcing me to go straight. My snakes head will have a slight vibration trying to break out of the forced straight. Sometimes I can regain control the first time but after that I can’t. I’m not sure what is causing this but it only happens when I am at the top of the leaderboard.